Bishop, Peytoo, and others. Expedit. Bishoprick of London, &c. Lord Wentworth. Ds. Howarde, Mag. Admirallus Anglie. 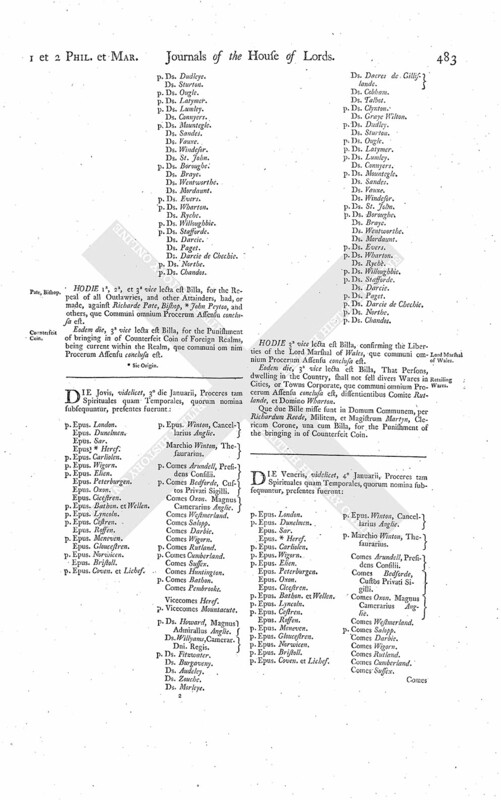 Prima, For the repealing of all Outlawries, and other Attainders, had or made against Richard Pate, Bishop, William Peytoo and others. Secunda, That Persons, dwelling in the Country, shall not sell divers Wares in Cities and Towns Corporate by Retail. 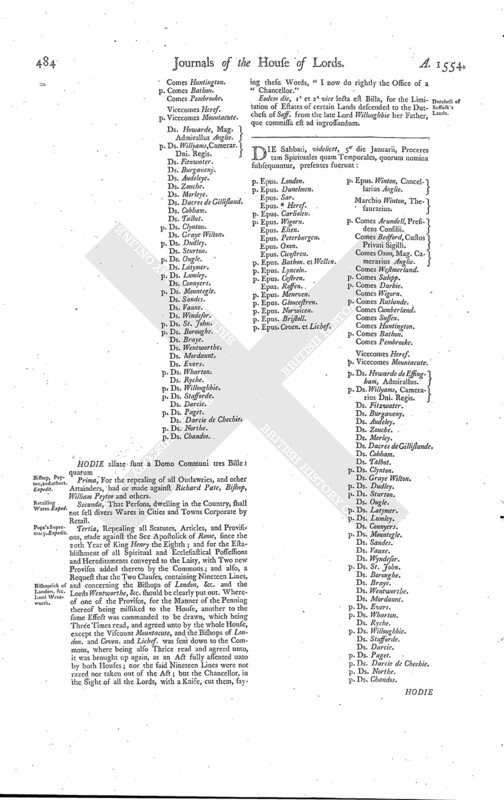 Tertia, Repealing all Statutes, Articles, and Provisions, made against the See Apostolick of Rome, since the 20th Year of King Henry the Eighth; and for the Establishment of all Spiritual and Ecclesiastical Possessions and Hereditaments conveyed to the Laity, with Two new Provisos added thereto by the Commons; and also, a Request that the Two Clauses, containing Nineteen Lines, and concerning the Bishops of London, &c. and the Lords Wentworthe, &c. should be clearly put out. Whereof one of the Provisos, for the Manner of the Penning thereof being misliked to the House, another to the same Effect was commanded to be drawn, which being Three Times read, and agreed unto by the whole House, except the Viscount Mountacute, and the Bishops of London. and Coven. and Lichef. was sent down to the Commons, where being also Thrice read and agreed unto, it was brought up again, as an Act fully assented unto by both Houses; nor the said Nineteen Lines were not razed nor taken out of the Act; but the Chancellor, in the Sight of all the Lords, with a Knife, cut them, saying these Words, "I now do rightly the Office of a Chancellor." Eodem die, 1a et 2a vice lecta est Billa, for the Limitation of Estates of certain Lands descended to the Dutchess of Suff. from the late Lord Willoughbie her Father, que commissa est ad ingrossandum.